Trade in the traditional dad tie for something he will really enjoy, an island adventure. Make memories with him this Father’s Day by visiting Catalina, where he can make the catch of the day or relax beachside with his favorite brew or cocktail. The Island offers a variety of activities for every type of dad, so being bored is never on the agenda. For the dad that has the need for speed, Catalina welcomes a new water tour called the Cyclone Sea Adventure. You’ll take in spectacular views of the shoreline while speeding across the water with the wind in your hair and sun on your face during this coastal cruise with attitude. If off-roading is more his style, check out the Jeep Eco Tours hosted by the Catalina Island Conservancy. While being navigated through unpaved roads you will learn about the history of the Island and experience parts of the Island many have not seen. Both options are definitely a wild ride. If dad’s ideal vacation is a Corona commercial, we know the spot just for him. The Island has a private beach called Descanso Beach Club that includes cabanas and beach lounges for rent. Servers will come to guest with a full menu, so dad can have a beer in hand with his toes in the sand. To the fathers who let out their stress through a round of golf, Catalina proudly offers visitors the opportunity to play on the oldest operating course west of the Rocky Mountains. No matter who wins, everyone can enjoy $1 tacos and cold beer at the Sandtrap, the unofficial 19th hole. With dads who would rather catch a fish than score a birdie, Catalina attracts a wide range of marine life including white sea bass, marlin and yellowtail. You can either charter a boat with a guide or not, depending on your familiarity with the sea. 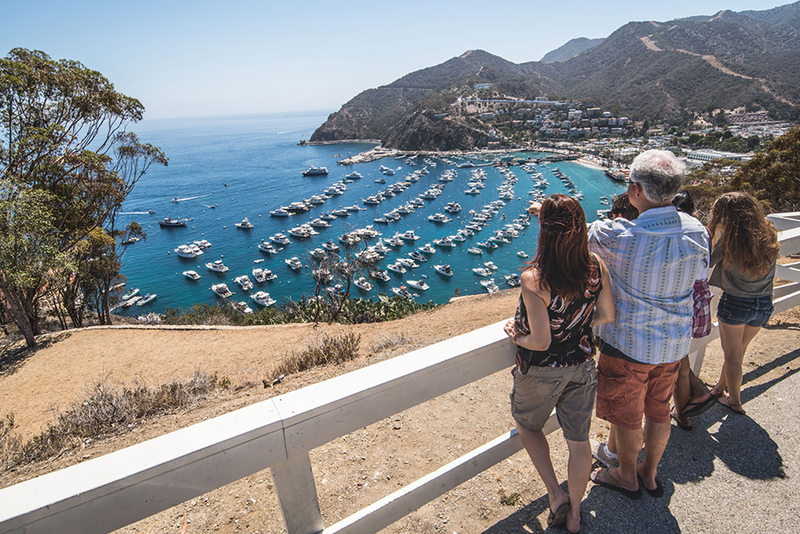 The next step to planning this adventure with dad is by booking his reservation ahead of time or purchasing a Catalina Express gift card, so he can go anytime during the year. However, you decide to enjoy your memorable trip with dad, remember that spending time with you is the best gift you can give.